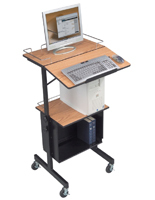 This multimedia presentation cart is ideal for classrooms or facilities. 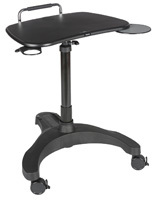 Each sturdy portable equipment stand is designed for use as a lecture, meeting, training, or office accessory. 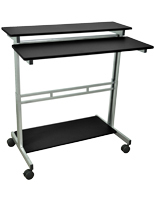 This 42" tall multi media presentation cart is made from durable black finish polyethylene plastic. This commercial grade fixture offers a roomy 24" x 18" top surface with 19" x 15" pull-out shelf for laptops, keyboards, or other equipment. 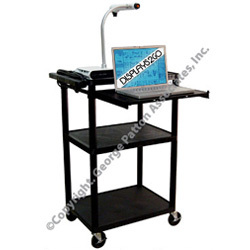 This versatile laptop presentation cart can serve as meeting or classroom furniture, conference accessory, and even as a workstation as needed. This sturdy fixture is designed to support up to 400 lbs of equipment. This rolling AV presentation cart with pull out shelf has four heavy duty 4-inch caster wheels, two of which lock for stability during use. This professional-grade audio-visual trolley is designed with usability in mind and includes a built-in 3-outlet power strip as well as a 15-foot extension cord. 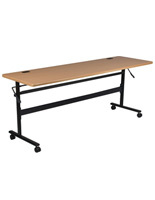 This black plastic AV cart with locking casters is an economical choice for schools, businesses, facilities, and offices that need durable audio-visual furniture. 18.0" x 42.0" x 17.5"